Online tee times are not availabile for Victoria. 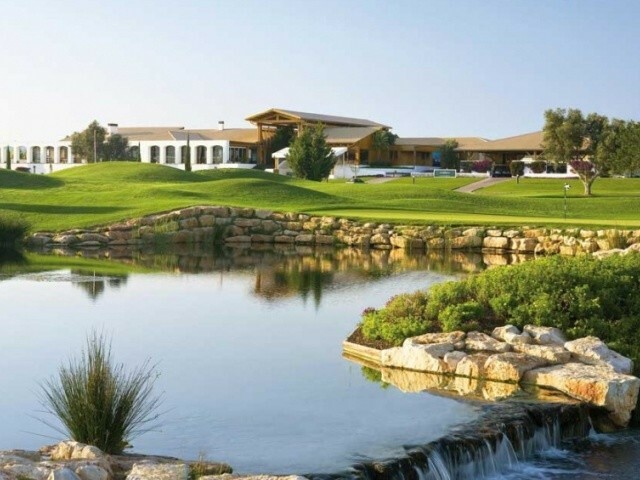 The 18 hole championship Victoria Golf course is one of the newest courses to be opened in the Algarve. The holes have been laid out over virtually flat terrain which has been then reconstructed to provide an undulating surface. A series of waterfalls into lakes create visual attraction to players beside providing an agreeable background sound. It is at present the longest 18 holes golf course in Portugal. Each hole of the Victoria Course has been designed to give the player a choice of five tees to play off so as to make it suitable for golfers of all handicap levels. Best course I've ever played in Portugal. Its the sort of course where I really looked forward to getting to the next tee box and seeing the next whole coming up, excellent fun. We were dropped off early (7am for a 8am tee off) for our tee time but nothing was open until 7.30 so not much chance of a coffee/breakfast. We were a 5 but starter allowed us to go out earlier as a 2 and a 3 rather than be joined up with a 2 ball who had originally been allocated similar tee times. Being the first groups out meant we were able to fly round and not having to be paired up with hackers or duffers was a welcome change.